So, PopPop brought laptops for the girls this Christmas. The first thing we installed on them was the Windows Live Family Safety software. The software allows you to set up daily time limits so your kid doesn’t stay glued to a bright screen all day. The girls know they have a time limit and that’s just the way it is. As a result, they can stretch it out during the day, but their computer will automatically shut off at 9 pm and won’t start till 8 am. It has worked perfectly in our household. It doesn’t have to be a grandiose event. Remember, these are kids. Simple is best. If your kid is a budding artist, get some art supplies and plan on spending some quality time with your child creating a masterpiece that can later be framed on a wall in their bedroom. Most of all, not only will your child love the time spent with them, but there will be a precious memento to look at daily. Win-Win. Got caught by the train. Yes, get on your bike. Do you remember the last time you went on a bike ride? If you can’t remember the last time you rode a bike, then maybe it is time to get the dust off you bike and go for a ride. An unintended benefit of riding a bike is that you can’t play with your phone will riding, or at least you shouldn’t. 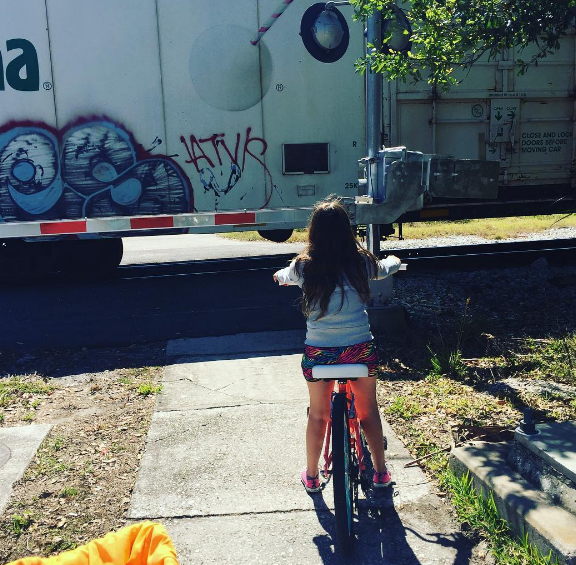 From my experience, I have learned more about my kids’ lives during a bike ride than any other time. The cool thing about going out for a bike ride, is that it serves two purposes: 1. you get out of the house, 2. you get some exercise and no one is the wiser. Therefore, it’s a great way to trick your kid into an active lifestyle. And as a result, the more you practice it, the more they will be the ones initiating bike riding. Let’s be honest. It all comes back to us as parents. So, if we want our kids to behave a certain way, then we should lead by example. I’m a firm believer that our kids are a reflection of us. Kids imitate what the see. If we want kids to use less electronics, then it’s on us parents to set the example. At our house, I strive to set my phone down once I walk in the door and not look at it until the girls have gone to bed. It’s tough. These are my top 4 tricks to get my kids away from a computer. What are your tricks? Share your tricks in the comments below. I’d love to add some to our household!